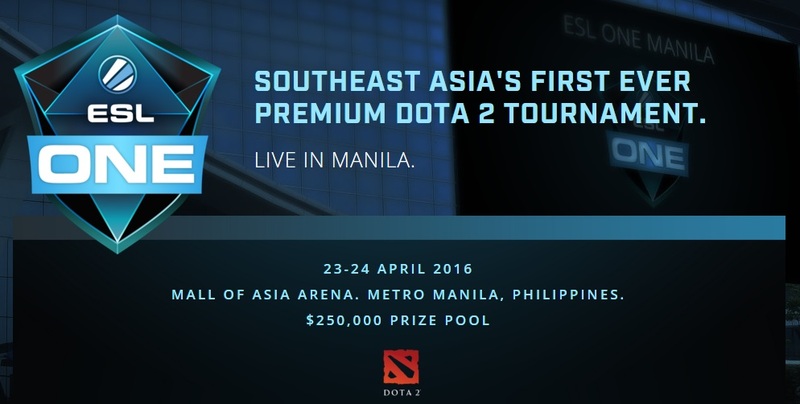 ESL, the world’s largest esports company, has today announced that it will host South East Asia’s largest esports competition in the Philippines: ESL One Manila by PLDT Fibr & Smart GameX is set to award US$250,000 from April 23-24, 2016 in the Mall of Asia Arena. ESL One Manila by PLDT Fibr & Smart GameX marks a prize money milestone of US$750,000 in relation to ESL’s promise to pledge one million dollars in Dota 2 prize money over a twelve month period. The ESL One tournament series has taken Dota 2 to iconic locations such as the 2006 football World Cup stadium in Frankfurt, Commerzbank-Arena, and the famed Theater at Madison Square Garden in New York, both of which have been pioneering in their own right. ESL One Manila by PLDT Fibr & Smart GameX in the Mall of Asia is set to be South East Asia’s largest esports event to date and will be ESL One’s first appearance on the Asian continent. For more information regarding the event please visit the official ESL One website.